Students of Jalala Junior Secondary School of Ilorin South Local Government Area of Kwara State, Nigeria, have expressed their rare sense of joy and inspiration at the advocacy lectures organised in their school by Hope Spring Water Charity on Wednesday 20th of February, to mark the World Social Justice Day. The organisers said the event is aimed at drawing attention of participants and the global community to social inequality issues surrounding water, sanitation and hygiene in Nigeria and in the host public school. The students said they learnt to be sensitive to the needs of deprived and less privileged individuals and communities on account of the advocacy lectures organised in their school by Hope Spring Water Charity on 20th of February, to mark the World Social Justice day. Youngsters including Adeyemi Samuel, Williams Joshua, Muhammed Amida, and several other students of the school described the event as helpful and rewarding, and thanked the founder and members of the Hope Spring Water Charity for deriving pleasure in putting smiles on the faces of the less privileged through provision of drinkable water, sanitation and hygiene to those who need them. In his address at the event, the Focal Person of the Regional Center of Expertise on Education for Sustainable Development (RCE Ilorin), Professor Albert Olayemi, identified potable water, good hygiene and proper sanitation as essential necessities of life and potent ingredients for human survival. Professor Olayemi who chaired the occasion, was represented by the Deputy Director, University of Ilorin Consultancy Services, Dr Olusoji Adebisi. He commended the organisers of the programme for showing interest in providing the less privileged with water and hygiene facilities to enable them live in good health. In his address, a member of the Board of Trustees (BOT) of Hope Spring Charity, Mubarak Oladosu, said the organisation was founded in 2015 by a UK based Nigerian, Mr. Temitope Shewu Odurinde, to provide succour to those communities that are in dire need of drinkable water and to fight disease and death through putting an end to open defection and other un-hygienic practices . Oladosu who spoke through Is’haq Babatunde, a journalist and Hope Spring volunteer, said the event was organised to commemorate the World Social Justice Day, saying that the school might witness more interventions from Hope Spring given that the organisation has been providing water for various communities in West Africa, and in Kwara, Osun, Lagos and many other parts of Nigeria. 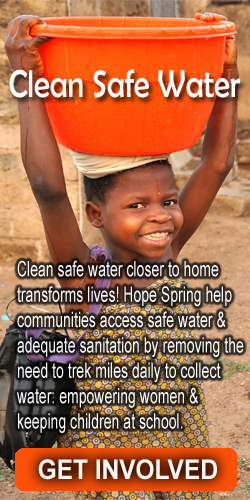 He said, “Hope Spring Water has done several water, hygiene and sanitation projects in Kwara, Osun, Enugu, Ogun, Abuja and Lagos States. The first was the water project in Adangba area of Ilorin in 2015 and the latest is the one we are holding here, this beautiful day…In Kongbari, in the heart of Ilorin, no single toilet is available for more than 30 households an no clean source of water was close by until our intervention…In Shao-Ile, a village in this state, cows compete with people for their source of water. We were told that for certain reasons, the cows always carry the day before our intervention.Five year olds and younger children in Gaa-Dare have to join in fetching dirty water even if all they would take home is a litter of dirty water”, he noted, poignantly. Other speakers at the event include an expert in Development Communication and Brand Ambassador of National University of Science and Technology, Russian Federation, to Africa, Mr. Jamiu Mustapha a, student volunteer of the Department of Education Technology , University of Ilorin, Mr. Thakib Korede Omotosho and Mr. Mr Abdulrahman Abulbaki, of Bang Photography . In her welcome address, the Principal of the school, Mrs. Shuaib Rafat thanked members of the Hope Spring for choosing her school for the programme and noted that the deprived school look up to the organisation for further interventions in providing source of clean water and toilets.